The season is the first Saturday in April through the last day of February. This only leaves the month of March that's out of season. So, what does hatchery supported trout water on the Blue Ridge Parkway mean? It was time for me to do some digging to see what I could find out. Certain North Carolina waters are supported by fish hatcheries. These fish are released several times annually during the months of March through August. Some hatchery supported trout waters will be stocked with as much as 860,000 trout. Most of these will be about 10" and about 4% will be around 14". Waters that are hatchery supported bear the green and white sign like the one I photographed. The imposed limits are to protect from overfishing and to respect wildlife. NC is famous for fishing and outdoor recreation. Stocking the waters helps boost the tourism industry and is good for the environment. 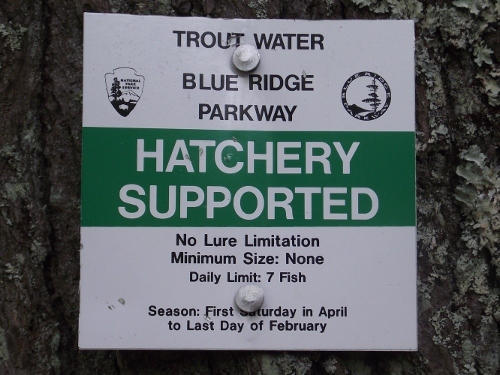 If you're like me and watch to learn more about fish hatchery supported waters check out the information right here: NC Wildlife and Trout Regulations.